Many of the items on the needs list can be purchased locally and, as indicated, some items must be purchased locally. If you would like to buy the items locally or have us buy them and have them ready for you to see when you arrive, please contact us at isiphocharity.trust@gmail.com. The Isipho Day Care Centre serves 300 children from birth through 6 years old. The center is located in Paterson, Eastern Cape, South Africa is run and managed by the NPO, Isipho Charity Trust. Isipho Charity Trust leads the community of Paterson and the Eastern Cape in their fight against HIV/AIDS and the negative socio-economic effects of the disease. 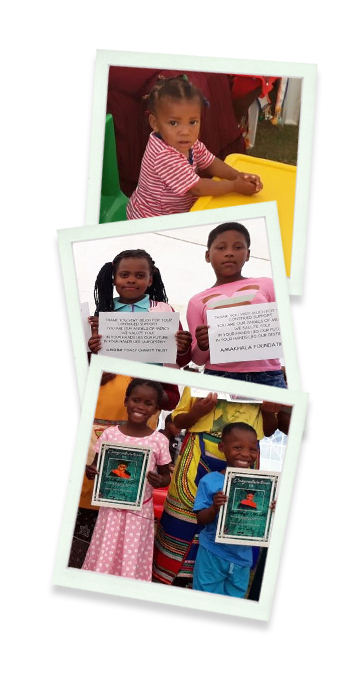 Using prevention, education, care, and support programs, Isipho Charity Trust unites, involves, and engages Paterson and communities across the Eastern Cape to lead the mobilisation, organisation, and empowerment of all community members who are infected or affected by HIV/AIDS. To provide therapeutic work in the living space of orphans and vulnerable children to enhance their cognitive, emotional, physical, spiritual and social development. To provide home and community-based care to all community members who are infected by HIV/AIDS or otherwise vulnerable.